Welcome to our Books section, with links to purchase these selections online through Amazon.com. Blue Skidoos to the Planets! Nickelodeon recommends this book of theirs for ages 3 and up. The book contains 27 stickers of planets and other objects that children can put in their appropriate places as a learning tool. The following Note to Parents from Creators appears on the back cover: "Blue and Steve skidoo to the planets and need help identifying them! This book, like all Blue's Clues books, uses our cognitive-based thinking skills and science curricula. It introduces children to the planets and their places in the solar system. The Blue's Clues mission is to empower, challenge, and build the self-esteem of preschoolers. We hope this book helps you and your child realize these goals!" List price is $5.99 U.S.
Let's Look at the Planets This is a "Poke & Look Learning Book". The publisher says "Poke & Look Learning Books are filled with intriguing die-cut holes to peek through, and lively text to make learning fun." This cardboard book is cut out near the bottom with index tabs that let a child put their finger on a picture tab and open up to that page. The book has 14 pages (counting front and back covers). Parents can read the text to a small child, or an older elementary school child can read the text. The pages briefly describe the Universe, planets, the Sun, pictures of the constellations, shooting stars, eclipses, telescopes, the Moon, and rockets (spaceships). List price is $9.99 U.S. Reader's Digest Pathfinder Series: Space This book is suitable for grades 4 to 7. It is 64 pages long, and substantial text accompanies its color illustrations. This paperback book is priced reasonably at $7.99 U.S.
Peterson's First Guide to Astronomy This book is only one of many in the Peterson Field Guide series, and is not the only one about astronomy. However, it is a great start into the world of "stargazing." This book shows how you can view many objects (such as constellations) without binoculars or a telescope. The list price is only $5.95. 1001 Facts About Space This book in D.K. 's Backpack Books series is loaded with color illustrations and descriptive texts on...apparently 1001 facts! It is 192 pages long, and has an index. It is suitable for high school age students and older. List price is $8.95 U.S., and is a great buy. Astronomy Demystified: A self-teaching guide This is a brand new title from McGraw-Hill, ©2003. It is 575 pages long, with a full index. It is available as a softbound book and as a digital Adobe eBook. This book should be easy reading for high school students and above. Unlike most astronomy texts, this book purposely is not loaded with trigonometric equations or higher mathematics. Descriptions of all phenomena are supported with black and white illustrations. The description on the back cover states: "Want to master astronomy or aerospace engineering but are intimidated by the complex formulas and equations? Tried other self-teaching guides but were turned off by the dry, complicated presentation? Problem solved! Astronomy Demystified is a totally different, very entertaining, and amazingly effective way to learn the mathematics, fundamentals, and general concepts of astronomy." If you're looking for non-mathematical explanations of astronomy, this book is unique in its coverage. List price is $19.95 U.S. 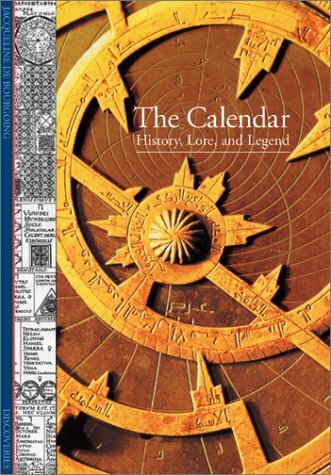 The Calendar: History, lore, and legend This is a book in the small but colorful Abrams Discovery series. It is 144 pages, with an index. You won't find formulas here, just light reading on the history of time measurement. It is loaded with color illustrations, but at the same time packed with historical descriptions. Color photos and diagrams of historic calendars and related diagrams will make this attractive to the scientist and the layman alike. Stonehenge Decoded This revolutionary book, now out of print, describes astronomer Gerald S. Hawkins' careful measurements, theories, and computer trials and tribulations that showed Stonehenge to be a far more complex astronomical computer than anyone previously imagined. Hawkins found that Stonehenge was not only aligned to show the sunrise at the summer solstice, but also had arches positioned to show the north and south extremes of movements of the Sun and Moon. He showed how the 56 positions around Stonehenge and the black and white rocks with them were an ancient 56-year eclipse predictor. This book is a remarkable journal of a scientist's path to discovery. Although written by an astronomer, it is not loaded with complex mathematical formulas that would put off most readers. Most of it discusses historical events, and Gerald Hawkins' path of discovery. If you are interested in Stonehenge as an astonomical computer and can find a copy of this book, get it. List price of the 1993 Barnes & Noble edition is only $6.98. Sundials: History, theory and practice This book by Rene R.J. Rohr is an excellent book for anyone interested in the history and mathematics of sundials from ancient Egypt to modern times. It contains complete instructions for creating a sundial for any latitude. Knowledge of trigonometry will be useful if you want to build your own sundials from this book, but not necessary if you just want to enjoy the historical and general discussions. Practical Astronomy with Your Calculator This is an oldie but a goodie. If you're interested in writing your own ephemeris software, this is a good starting point. It contains both low- and higher-precision calculations for most common astronomical calculations, especially involving the Moon and Sun. You'll need an understanding of trigonometry and simple matrix multiplication to get through everything in this book. With that, you could easily program the calculations in a computer program. The book is spiral-bound, so it lies flat. It is 185 pages, with a comprehensive index. List price is $22.00. Astronomical Algorithms This indexed, 429-page book takes astronomical calculations to a level beyond Practical Astronomy with Your Calculator. It covers just about every celestial phenomenon that would interest the amateur astronomer. It is loaded with trigonometric formulas. The book is 429 pages, with a full index. List price is $40.00 U.S. These are the same formulas used to compute the definitive U.S. Naval Observatory's annual Astronomical Almanac. It assumes knowledge of trigonometry, matrix multiplication, simple vector mathematics, and basic calculus. If you're aiming for perfection, this is the book to have. If you're interested in this book but don't have a copy of Meeus' excellent Astronomical Algorithms, start with Meeus. Then graduate to the Explanatory Supplement. Meeus' book contains more basic explanations that will help you get through all the fundamentals. This book is 752 pages, with a full index at the end. List price is $76.00 U.S. The Astronomical Almanac for the Year 2004 This annual almanac, jointly printed by the U.S. Naval Observatory in the U.S. and by Her Majesty's Nautical Almanac Office in Great Britian, sets the world standard for accuracy.